Contact: Kathy Brenkle, Director, Kathy by phone M-F between 8am and 5pm. Holidays: Standard holidays and teaching training days. Please see website for details. Part Time: Minimum enrollment is three mornings per week.These are official hours. Times may be adjusted somewhat according to family needs and availability. Fees and Tuition: Please email Moraga@tcdschools.com for rate sheet. Enrollment Information: Please call for current openings. Our programs are rich with learning; language, pre-reading, pre-math, physical development, and social skills. Children do in-depth explorations of the world around them through our project webs. We have many community and family events at our schools, as well as field trips for older children. The Child Day Schools - For over forty years TCDS has provided the most current educational programs within a caring and supportive community for children and families. When you visit us you will see teacher child interaction in all our environments, including outdoor play. 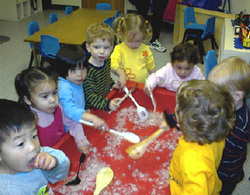 Our programs are rich with learning- language, pre-reading, pre-math, physical development, and social skills. Children do in-depth explorations of the world around them through our project webs. Our nurturing programs also support children's self esteem, self-reliance, creativity, and compassion for others. Conflict resolution is used in the classroom to guide children in developing the positive social skills they will use all their lives.